The English Hymnal is a hymn book which was published in 1906 for the Church of England by Oxford University Press. It was edited by the clergyman and writer Percy Dearmer and the composer and music historian Ralph Vaughan Williams, and was a significant publication in the history of Anglican church music. The preface to the hymnal began by describing itself as "a collection of the best hymns in the English language." Much of the contents was used for the first time at St Mary's, Primrose Hill, in north London, and the book could be considered a musical companion to Dearmer's book on English ceremonial, The Parson's Handbook. The high quality of the music is due largely to the work of Vaughan Williams as musical editor. The standard of the arrangements and original compositions made it one of the most influential hymnals of the 20th century. The hymnal included the first printing of several arrangements and hymn settings by Vaughan Williams. Among the most famous are Sine Nomine, a new tune to[[For All the Saints]; andYe Watchers and Ye Holy Ones, a new text for the hymn tune Lasst uns erfreuen. The hymnal also includes many original plainsong melodies (in plainsong notation). After its publication, use of the hymnal had been banned for a time by the Archbishop of Canterbury. 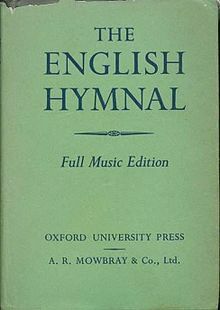 Ultimately, The English Hymnal, along with the Church Hymnal for the Christian Year, "undermined the uniformity of the Church of England and successfully challenged [the] hegemony" of Hymns Ancient and Modern, which had been published two years previous. The book is a characteristic green colour and is traditionally associated with the high-church or Anglo-Catholic movement within Anglicanism. When the book was published, high and broad churches used Hymns Ancient and Modern and evangelical churches normally used the Hymnal Companion to the Book of Common Prayer. The hymnal has, however, been adopted not only in various movements of Anglicanism but also in several other denominations in Britain, such as some Roman Catholic churches. A new edition of the musical content of The English Hymnal was issued in 1933, which principally had better accompaniments by J. H. Arnold to the plainsong melodies, and over 100 new tunes. This was achieved without renumbering hymns or extending the book excessively. Instead many formerly duplicated tunes were changed to new tunes. Where unique tunes were changed, the old tunes were moved into the appendix. A supplement to the hymnal, English Praise, was published in 1975. The New English Hymnal appeared in 1986, and its supplement, New English Praise in 2006, both under the imprint of the Canterbury Press, now SCM Canterbury Press. ^ Wilkinson 1985, p. 140. ^ a b Howse, Christopher (25 November 2006). "Sacred Mysteries". The Telegraph. London. Retrieved 13 November 2018. ^ Palmer Heathman 2017, p. 184. ^ Wilson-Dickson 2003, p. 234. ^ Wilkinson 1985, p. 131. ^ Hawes, John (2000). "The English Hymnal". London: Parish Church of St Mary-the-Virgin, Primrose Hill. Archived from the original on 17 February 2006. Retrieved 13 November 2018. ^ Wilkinson 1985, p. 52. ^ Leaver 1990, p. 482. ^ Kilcrease 2017, p. 93; Leaver 1990, pp. 483, 503. ^ Dickinson 1956, p. 244. ^ Luff 2007, pp. 17–18. ^ Luff 2007, p. 19. Dickinson, A. E. F. (1956). "Some Thoughts About 'The English Hymnal'". The Musical Times. 97 (1359): 243–245. doi:10.2307/936457. ISSN 2397-5318. Kilcrease, Bethany (2017). The Great Church Crisis and the End of English Erastianism, 1898–1906. Abingdon, England: Routledge. ISBN 978-1-317-02992-2. Leaver, Robin A. (1990). "British Hymnody, 1900–1950". In Glover, Raymond F. (ed.). The Hymnal 1982 Companion. 1. New York: Church Hymnal Corporation. pp. 474–504. ISBN 978-0-89869-143-6. Luff, Alan (2007). "The Twentieth-Century Hymn Explosion: Where the Fuse Was Lit". The Hymn. 58 (4): 11–21. ISSN 0018-8271. Palmer Heathman, Katie (2017). "'Lift Up a Living Nation': Community and Nation, Socialism and Religion in The English Hymnal, 1906". Cultural and Social History. 14 (2): 183–200. doi:10.1080/14780038.2017.1290995. ISSN 1478-0046. Wilkinson, Richard William (1985). A History of Hymns Ancient and Modern (PhD thesis). Hull, England: University of Hull. Retrieved 13 November 2018. Wilson-Dickson, Andrew (2003) . The Story of Christian Music: From Gregorian Chant to Black Gospel; An Authoritative Illustrated Guide to All the Major Traditions of Music for Worship. Minneapolis, Minnesota: Fortress Press. ISBN 978-0-8006-3474-2. The English Hymnal with Tunes (2nd ed.). London: Oxford University Press. 1933. Luff, Alan, ed. (2005). Strengthen for Service: 100 Years of the English Hymnal, 1906–2006. Norwich, England: Canterbury Press. ISBN 978-1-85311-662-9. Routley, Erik R. (1956). "The English Hymnal, 1906–56". Hymn Society of Great Britain and Ireland Bulletin. 4 (2): 17–26. Sceats, Godfrey (1951). "English Hymnal and Hymns A. & M.". Music and Letters. 32 (3): 235–246. doi:10.1093/ml/XXXII.3.235. ISSN 1477-4631.